Quinoa (pronounced Keen-wah) is a protein packed nutrient rich carb that can be substituted for most cereals or grains in your muscle building diet. Quinoa is a high protein “super-carb” that is packed with B vitamins for energy, calcium and magnesium for a healthy nervous system, iron needed to transport oxygen around the body, the amino acid lysine for muscle building and vitamin E, a powerful antioxidant. Compared to rice and oats quinoa is a great carbohydrate source that is much higher in muscle building protein. Quinoa is a complete protein which means that it contains all 8 essential amino acids that your muscles need for growth and repair. For every cup of cooked quinoa you eat you’ll take in 223 Cal, 39g Carbs and 8g Protein. Compare this to another popular carb, 1 cup of cooked white rice gives you 242 Cal, 53g Carbs, 4g Protein and you can straight away see the nutritional benefits of eating quinoa as your carb choice to build more muscle. Quinoa’s nutritional profile makes it an ideal post-workout meal. 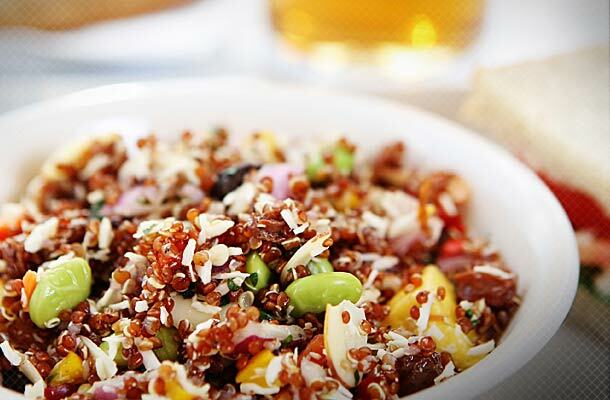 In Australia quinoa comes in three main varieties: white, red, and black. White quinoa has a mild flavour, while red and black quinoa tastes earthier and a bit nuttier. Black generally takes the longest to cook and has more of a crunchy texture. 1 cup of uncooked quinoa will usually serve 2 people. Quinoa is a super-versatile cooking ingredient that can be served in so many delicious ways. For breakfast, enjoy quinoa as a power porridge with a scoop of Vitalstrength Whey Protein, banana and yoghurt or add it to a protein smoothie. For lunch try tossing it through a salad with a tin of tuna or make a quinoa tabouli salad. For dinner you can add quinoa to a stir-fry, soup, frittata or chicken patties. Now that the basics are out of the way, it’s time to start working this high protein super carb into your muscle building meals and snacks! Next articleSUPERFOODS FOR YOUR MUSCLE BUILDING DIET: WHAT IS KALE?